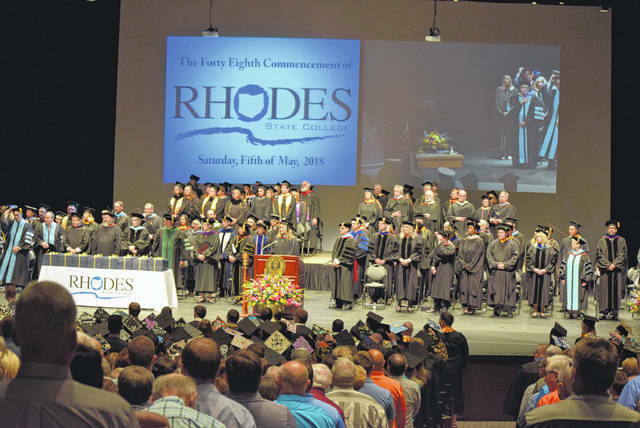 It was a packed house for Saturdays commencement for Rhodes State College. This was the institutions 48th Commencement. 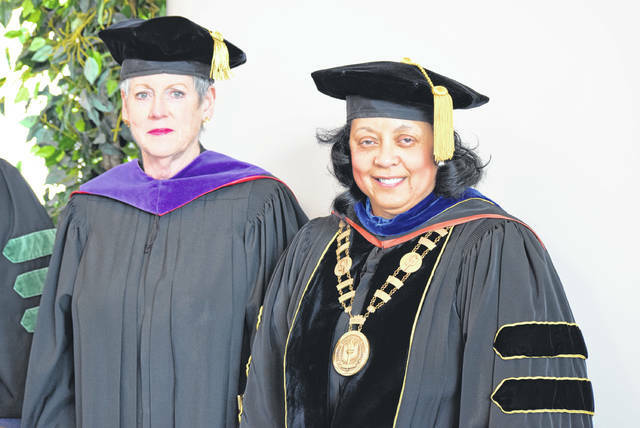 Ohio Supreme Court Chief Justice Maureen O’Connor (left) stands next to Rhodes State College President Dr. Debra McCurdy at Saturday’s graduation ceremonies at the Civic Center in Lima. LIMA — It’s a day like no other day for the graduating class of 2018 at Rhodes State College. A milestone has been reached in their lives, and now it’s up to them to seize the opportunity. “It’s always great to see our graduates finally at the end of their journey, at least this part of the journey. The real journey starts once they leave us as well but it’s a little sad but this is why we’re here so we’re happy that they’ve come. We’re happy to see them go in a very good way and it’s just a tremendous experience to see so many students starting off in careers or going on for transfer programs,” said Debra McCurdy, President of Rhodes State College. Ohio Supreme Court Chief Justice Maureen O’Connor was the speaker at the 48th commencement of Rhodes State College Saturday at the Veterans Memorial Civic Center. “Keep your options open, keep your eyes open because with the degree you have achieved, there’s going to be opportunities that right now you may not even realize are out there. So instead of putting blinders on and moving forward in a way that you think your career’s going to go — that’s great to start with — but don’t be inattentive and miss opportunities along the way,” said O’Connor. She said opportunities in her life led her to where she is today. “I graduated from college, thought I was going to be a teacher. I worked on a Masters in Teaching and then I decided that that was just not a career for me, and I always joke thousands of children have benefited from that decision. Then I decided I would go to law school, and even with a law degree, I thought I would be in private practice, and here I am, Chief Justice of the Supreme Court [in Ohio]. A lot of opportunities presented themselves, and because I was prepared, I was able to take advantage of it,” she said.